The photographs of Ian Dodd are rich in lyrical beauty and a sensuality not often associated with the documentary genre. Dodd was born in Sydney in 1937 and has worked extensively throughout his career spending time as an illustrator, as well as an art director for a major magazine publisher. The stylised nature of his photographs also suggest an illustrative quality. Some of his works, abstract the familiarity of nature to create highly aestheticised images. 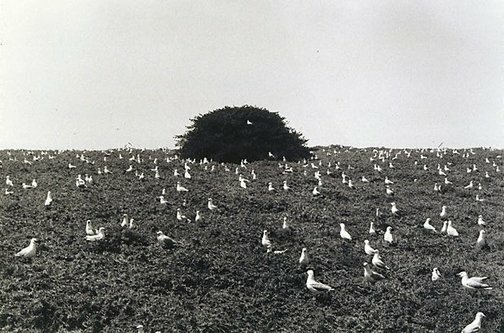 In 'Silver gulls, Port Kembla' 1982 the picture actually appears to flatten as the landscape recedes into the distance, the forms of the gulls becoming mere white patches on a vertical plane. There is a particular lustre to his photographs: Dodd's use of contrast is dramatic, with bright whites and deep blacks dominating and imbuing his photographs with a poetic radiance. Signed and dated c. verso, pencil "...1982/ ...February 2000 .../ .../ Ian Dodd ...".